So tomorrow we'll welcome Callie to the ranch, where she'll be cherished. More info -- and photos -- on this girl once we see her! Okay, so this may not look like a waiter with a dinner tray and fancy linen to you, but to our horses, this is room service indeed. 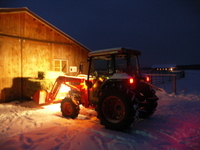 After a day of snow and temperatures that barely got above 20 degrees, for the horses there is no finer sight than a tractor carrying 500 pounds of hay bales headed towards them. I was eagerly greeted by several horses who acted like they hadn't eaten in weeks (in truth, since they finally finished up their breakfast at about 11 a.m. this morning!). In case you're wondering, they didn't get all 500 pounds -- I fed about two of the bales and stacked the remaining five for feeding tomorrow. 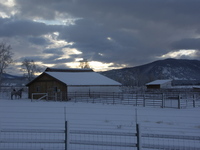 In the distance you can see the lights from Beauty's Barn, our new barn for blind horses. Alayne was taking care of the horses there while I was loading the hay at Scout's Barn. Our fabulous graphic designer, Terrel Armstrong, just set up our new slide show this evening. The photos were taken by a Missoula photographer, Logan Castor Parson, earlier this summer for a wedding that occurred in October. The bride and groom are wonderful friends and supporters of the sanctuary, and they wanted their wedding guests to learn about the animals. So each table at the wedding reception had a beautiful card with a photo of an animal and his or her story on it. The photos in the slide show are just a few of the many that Logan took for the wedding. She graciously gave us permission to use these images. You can see the new slide show by going to our Web site home page here. New Arrivals, New Newsletter, and More! We updated the Web site over the holiday weekend and posted our new arrivals as well as the digital version of our new winter newsletter. We also had some great news to announce with Pappy's Fund! You can see it all from our Web site home page here. Hope everyone had a wonderful Thanksgiving. We certainly did. It's been snowing off and on for days, and on Friday it was blowing so hard (19 mph) with snow coming in sideways that we had to leave the horses in their stalls most of the day. It was 3 p.m. before we could finally turn them out. It looks much more like winter here than fall! Our two new arrivals saw their respective vets today. This morning I took Timmy the paralyzed black Lab to our specialist in Missoula, Dr. Dave Bostwick, for an evaluation. Dave concluded that Timmy's problem is neurological in origin and that he didn't have any form of muscular dystrophy. He also doubted that Timmy had cerebellar hypoplasia because he doesn't have any of the signs typically associated with the condition. Dave believes Timmy's neurological problem is either in the brain or possibly in the neck (i.e., nerve damage), but not farther down his spine. To get any more detailed answers would require an MRI at Washington State University Veterinary Teaching Hospital in Pullman. An MRI might reveal the nature and location of the problem, and only then would we even know if anything could be done surgically ... but it's not likely. We decided to think about this over Thanksgiving and talk with Dave again next week. Although I had the camera in the truck, I forgot to take it into the clinic for the exam (dang! ), so the photo of Timmy is one I took on Sunday. This afternoon our equine vet, Dr. Bill Brown, came out to the ranch to examine Smokey, the old blind mare who also arrived on Saturday. He started with a complete eye exam. In the first photo Bill's using an ophthalmoscope. He found that Smokey is centrally blind, i.e., the main optic nerve is not functioning. She does not show any signs of uveitis, the type of inflammations that frequently lead to blindness in horses. 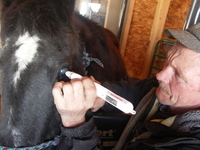 In the second photo, Bill is using the Tono-Pen to measure her intraocular pressure. Her right eye appeared to have glaucoma, while the left eye shown here did not. As it turned out, her right eye had an above-normal intraocular pressure that would indicate a mild case of glaucoma. Her left eye was within the normal range for intraocular pressure. Both findings were consistent with the appearance of each eye. The strange thing is that in horses glaucoma is usually secondary to some other ocular disease, like uveitis. Yet Smokey does not have any other eye diseases. How she went centrally blind is a mystery. 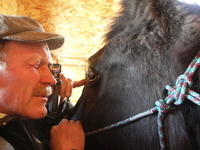 Our other centrally blind horses, like Lena, lost their vision to trauma. With no history on Smokey, we can only guess. Next came the dental work. Smokey's teeth were a disaster! Worn down, jagged, and hardly able to grind food. No wonder her mouth squeaked when she tried to eat. Old horses often have bad teeth (many horses never get dental work at all), and Smokey's were worse that most. In this photo Bill is doing the initial dental exam. 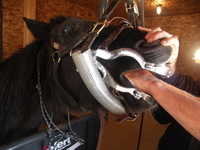 The metal device you see is a speculum, which holds the horse's mouth open (allowing the arm to be safely inserted!). Then he floated -- filed down -- and aligned Smokey's teeth and extracted a bad tooth. All in all, it took about 2 hours to do everything that Smokey needed. When he was done, Bill turned to me and said, "That horse is going to be feel a heck of a lot better now. I know we really did her some good today." As Liz and I were winding our way across Montana and Idaho towards Washington, back at the ranch Alayne was greeting Timmy, a disabled black Lab who had been rescued by a Denver vet hospital. 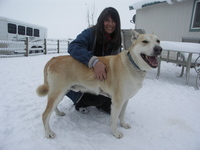 Peggy B. and Kelly T. had driven Timmy up from Colorado to the sanctuary. We'd been told that Timmy had cerebellar hypoplasia, like our dog Allie. It turns out that Timmy has virtually none of the characteristics Allie has. 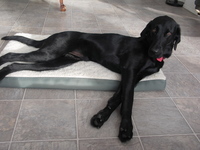 In fact, he looks and acts very much like Birdie, our black Lab who has a form of muscular dystrophy. Unfortunately, Timmy is not anywhere as mobile as Allie or Birdie. He is much closer to being a paralyzed dog than we expected him to be. It's not clear to us what his underlying medical condition is, so we will be taking Timmy to our internal medicine specialist for a definitive diagnosis. Whatever his problem, Timmy is a sweet, affectionate, talkative boy who has already won our hearts. I took the photo of Timmy this morning in our living room. Meanwhile, Liz and I arrived in Spokane to meet Heidi A. from Columbia Basin Equine Rescue. We were actually picking up two horses from Heidi -- the blind one we had agreed to take, and another slaughter-bound horse that a lady in Frenchtown, Montana, had adopted from Heidi's group. We had offered to transport the other horse back to Montana since Frenchtown was right on our way. The photo shows Liz (on the left) and Heidi, just after we loaded the two horses in our trailer. The blind horse, which they named Keller, is behind Liz, and that's Cashew on the right. We delivered Cashew to her new home in Frenchtown -- back in freezing fog in the dark! -- and then I dropped Liz off at her home in Missoula. Alayne came out to help me unload blind Keller and get her into the barn. 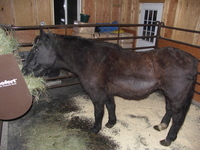 This old blind mare has the thickest hair coat we've seen on a horse, and along with a bit of a pot belly, we're now thinking she may have Cushing's Disease. She also has trouble eating, and we could hear loud squeaking noises coming from her mouth when she chewed. (Ouch!) Her hind feet seem to be bothering her, too. Needless to say, we're calling our equine vet first thing Monday morning. This blind mare wasn't in the stall for 15 minutes before Alayne gave her a new name: Smokey. It was clear she wasn't used to being in a stall -- we bet she'd never had this kind of comfort before in her life -- but she trusted us that everything was going to be okay. We took the photo of her last night, soon after we turned her into her stall. You can see she was already enjoying a late dinner! We had just gotten up this morning, and I was in the office checking e-mails while Alayne went to make coffee. Suddenly she called to me from the living room. "Come look at this!," she said. "Quick!" I got up and dashed out of the office, and she motioned to me to come over to the living room windows. "Look, it's the foxes!," she said, pointing to two young foxes playing just 20 yards from the house. One had a stick in its mouth, and the other fox was trying to take it away. (Hmm. Seen this before somewhere.) I scurried back to the office to grab the camera. By the time I got back to the living room windows, they had taken off, now playing a chase game. I pressed the camera lens against the window and started clicking, not sure if anything was in focus. Amazingly, these came out okay. In the first photo the two foxes are starting to lope off, the fox with the stick in the lead. The next photo shows them in mock battle over the stick. The final shot shows the 'vanquished' fox deciding to make himself king of the hay bales. "Who needs the stupid stick, I've got the hay bales!" he seemed to be saying. The funny thing about this animal sanctuary is that we are home to this family of foxes, too. Each year there's a new litter of pups, and they grow up on the ranch. The foxes feel safe here, because all around us are packs of coyotes. Almost every night we can hear the coyotes howl from the neighboring ranches. Coyotes kill foxes and drive them off, because they see them as competition for food. Although we have the occasional coyote wander through, for some reason -- it's probably all the dogs -- the coyote packs never come on to the ranch itself. And because the foxes grow up here, they pay absolutely no attention to the dogs at all. They couldn't care less. Sometimes late at night, once the dogs are put up, the foxes will climb over the fences and go over to Widget's House, where they drag the dog bedding off the cots on the porch and leave it out in the grass for us to find in the morning. I think it's the canine equivalent of "So there! We showed you!" Alayne brought blind Cedar home from the vet hospital in Helena this morning. He'd been there for several days, after having a tumor on his chest removed. In the photo Alayne is pulling his skin up so you can see where the surgery was, just below her hand. I thought the surgery site would be much more noticeable and extend up along his ribcage, but you can't really notice it because it's all underneath. We are still waiting on the biopsy report ... all we know at this point is that it was NOT a harmless fatty tumor, the kind you typically see sprouting on older dogs. But we don't know what kind of tumor. For now we're just hoping for the best. Cedar was SO thrilled to come home to the ranch. He was just smiling and almost dancing. He's such a sweet, loving, happy boy. You can read his original story here. On the subject of cancer, our UPS driver dropped off today our latest shipment of dexamethasone, a corticosteroid we're using to treat lymphosarcoma in our blind horse Chance and in our old mule Lonesome George. Because of the quantity we go through, our vet orders it for us by the case. 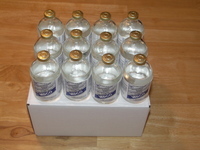 This supply should last several months. Fortunately we do not have to inject Chance and George with it. We give it to them orally every other day by squirting it into their mouths with a syringe (minus the needle, of course!). It's bitter tasting and neither one looks forward to what we call "dex day," but it's sure a lot better than having to inject them. As I post this, Alayne is in Helena tonight hosting a table at an event called 'Great Conversations.' It's an annual fund-raising dinner for the Helena Education Foundation. They invite 45 people who are considered to be doing "interesting things" and ask them to host a table and lead a conversation about a topic of their choosing. People then sign up for the table and topic that interests them, with dinner tickets going for $60. Along with the great conversations, Alayne's in great company, too. Among the other table hosts are the Chief Justice of the Montana Supreme Court, another Montana Supreme Court Justice, the Lieutenant Governor, the author Tom McGuane, and more professors and Ph.D's than I ever thought possible to get in one room. (Okay, it's a hotel ballroom.) For more about the event and the various topics, go here. 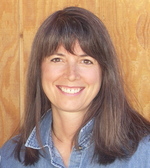 Alayne's topic, of course, is central to what we do: "Can Disabled Animals Enjoy Life?" We find that many people expect disabled animals to be sad, pathetic creatures looking forlorn. Then they come out to the ranch for a visit and see the blind and deaf dogs romping and playing, the blind horses contently grazing, and the other animals with various disabilities just having a good time. Sometimes, before visitors leave after their first visit, they take us aside and confess that they had been concerned about coming out because they thought this would be a sad place. Instead, they saw how joyful the animals are, how incredibly 'normal' they are, and how different it is from what they expected. 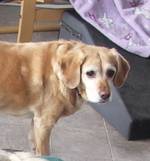 With Alayne gone for the evening, our little blind dog Goldie -- part of our original 'Seattle six-pack' of dogs -- is in her usual funk. She gets really upset when either one of us is gone. Goldie sits outside, patiently waiting for the sound of the truck coming down the drive. On cold nights like tonight, she would sit outside for hours, ignoring the frigid temperatures, if we let her. Instead, we have to herd her back inside, and then keep an eye on her to make sure she doesn't sneak outside again. She feels her 'pack' isn't complete when we're not both here. When we were putting all the animals up last night around 9:30 p.m., the snow was coming down steadily. Sometime overnight the wind came up and started hammering the snow in sideways. This morning every west-facing wall is covered in snow. I took the photo at dawn today. You can see two of our horses, blind Cactus Jack (the gray one in the foreground) and Copper Kid, our wobbler, in their corral by Scout's Barn. They heard us let the dogs out and came over to remind us that they hadn't had breakfast yet. When the wind drives snow in with this kind of force, all the gate latches are jammed tight and frozen. The hardest part about this morning's chores was just getting the gates to the corrals open!